The holiday season is my second favourite time of year for makeup right after summer because I love my coral! 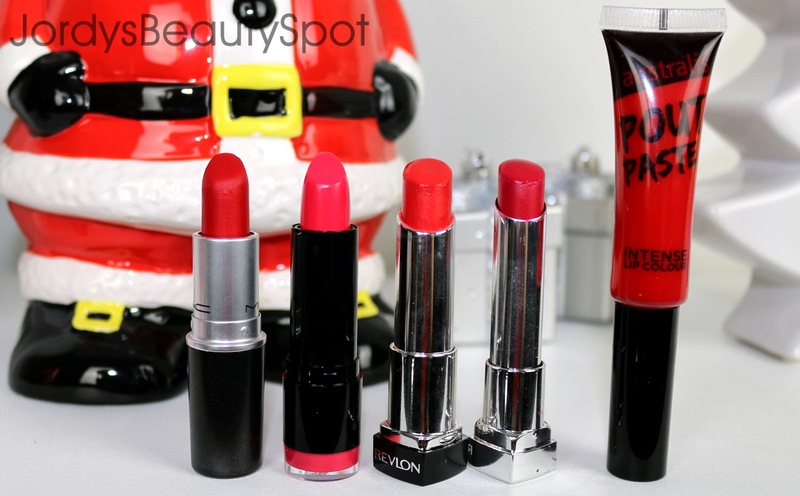 One of my favourite Christmas makeup items is definitely red lipstick so I thought it would be a fun and festive idea to show you my top 5 favourite holiday red lipsticks. No two red lipsticks are made equally so although all these 5 lipsticks are red...they are different in their own way and that's what makes me love them. This is definitely my go-to red lip and an absolute favourite red of mine. This particular lipstick gets a bad rap for being drying on the lips but personally I feel like that achieves a long lasting lip colour that more moisturising products can't. This shade will last me all day through eating and drinking just because it does have such a dry formulation and stays put. The way I would describe the colour is like an overripe cherry, a deep dark red. This was one of the first five MAC lipsticks that I ever bought because I was looking for my perfect red and all these years on it remains my favourite matte red that I will use any excuse to wear. Swatches (from left to right): MAC Ruby Woo, NYX Fire, Revlon Candy Apple, Maybelline Who Wore It Red-er and Australis Pout Paste. Now moving on to a trusty Revlon lip butter, a range of which I was obsessed with an owned every single colour, and this is one of my favourites from the line. Candy Apple is a gorgeous bright apple shade that is made is extremely wearable due to it's glossy and more sheer formulation. The orange undertone of this lip butter adds a coral pop perfect for summer. Since it is more sheer and glossy, it's much more subtle and therefore made more wearable. Next onto the Maybelline equivalent of a Revlon Lip Butter, this Color Whisper provides a more purple undertone berry stain. It has a similar pigmentation and formulation of a Lip Butter as it is quite sheer and provides a glossy finish. This makes for a more subtle and wearable colour, perfect if you are going for more of a neutral look. This is sort of in the middle ground between a pigmented lipgloss and a liquid lipstick making it absolutely perfect for anyone who loves moisturising yet pigmented lip products. I wanted to throw in a little tip here which is to always use a red lip liner in conjunction with bold red lips. When it comes to festive red lips, there's nothing worse than having the colour feather outside your lip lines or end up all over your face. Use a lip liner to help the lipstick stay put and in place all day. The exceptions to this rule are Revlon "Candy Apple" Lip Butter and Maybelline "Who Wore It Red-er" Color Whisper since they have such a sheer formulation and are more subtle, mistakes outside the lines are more easily forgiven. I hope you all enjoyed reading about my top five holiday red lipsticks. I would love to hear what lipsticks you girls love wearing around the holiday season so let me know in a comment below! * The Maybelline and Australis products were gifted. have you tried mac's russian red? What's a good red lip liner to wear with red lipstick?